The Stroma is a veneered coffin, with flat sides and lid, finished in a satin natural oak. This coffin is made in Perthshire, Scotland. 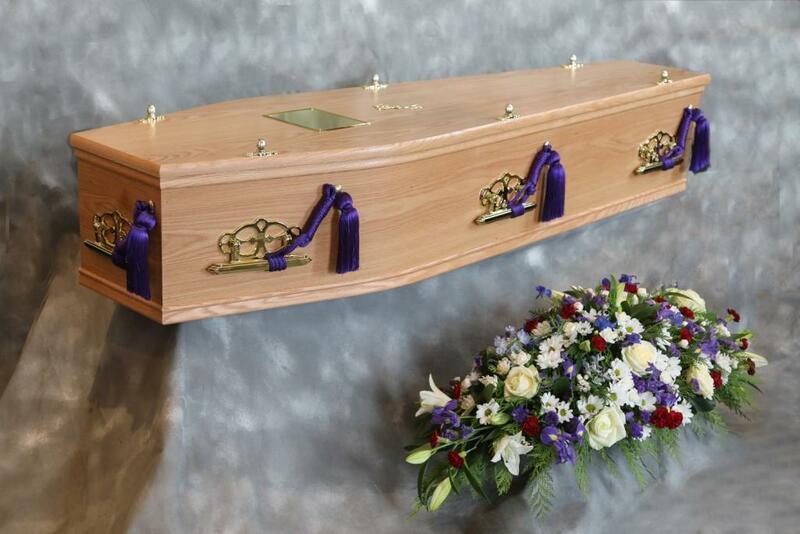 We then furnished the coffin with brass effect handles, back plate & nameplate, shown here with purple lowering cords. The interior is fitted with luxury silk side sheets, pillows and a 4” frill, we normally use an ivory coloured set but a selection of colours are available. Lowering Cord colours are Brown, Gold, Blue, Green, Maroon or Pink and can be viewed at the bottom of the page. The Skaill is a veneered coffin, with flat sides and a raised lid, finished in a polished golden oak. This coffin is made in Perthshire, Scotland. 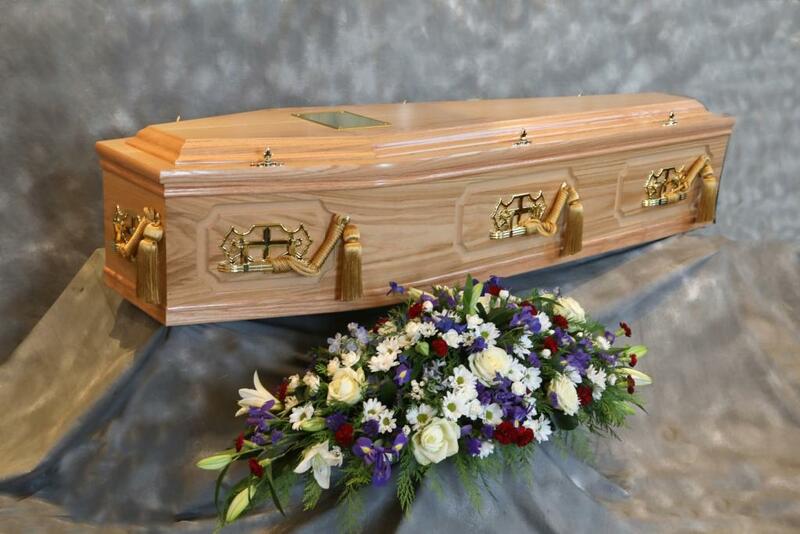 We then furnished the coffin with brass effect handles, back plate & nameplate, it is shown here with brown lowering cords. The interior is fitted with a luxury silk side sheets, pillows and a 4” frill, we normally use an ivory coloured set but a selection of colours are available. The Copinsay is a veneered coffin, with distinctive routered side panelling, and a raised lid,finished in a highly polished natural light oak. This coffin is made in Annan, Dumfriesshire, Scotland. 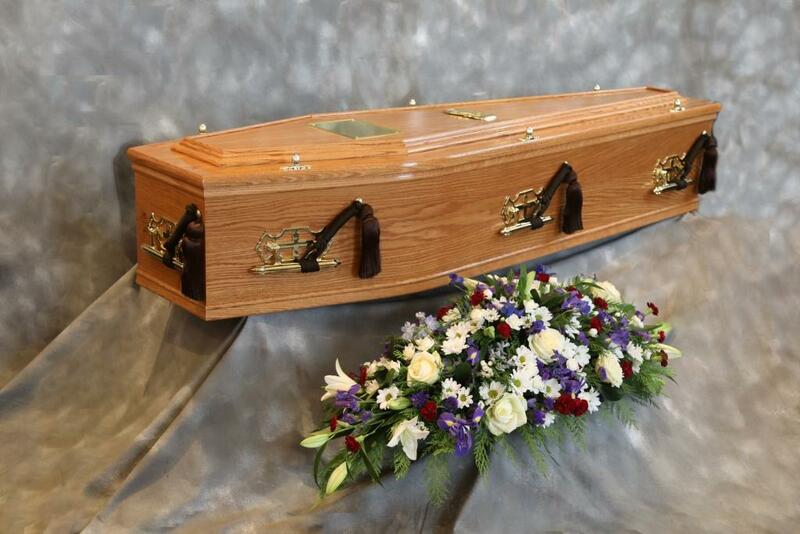 We then furnish the coffin with brass effect handles, back plate & name plate, with gold lowering cords. The interior is fitted with a luxury silk side sheets, pillows and a 4” frill, we normally use an ivory coloured set but a selection of colours are available. This coffin is also available in a solid oak. The Fara is a veneered coffin, with flat sides and a distinctive high raised lid, finished in a highly polished plum mahogany. They are made in Annan, Dumfriesshire, Scotland. 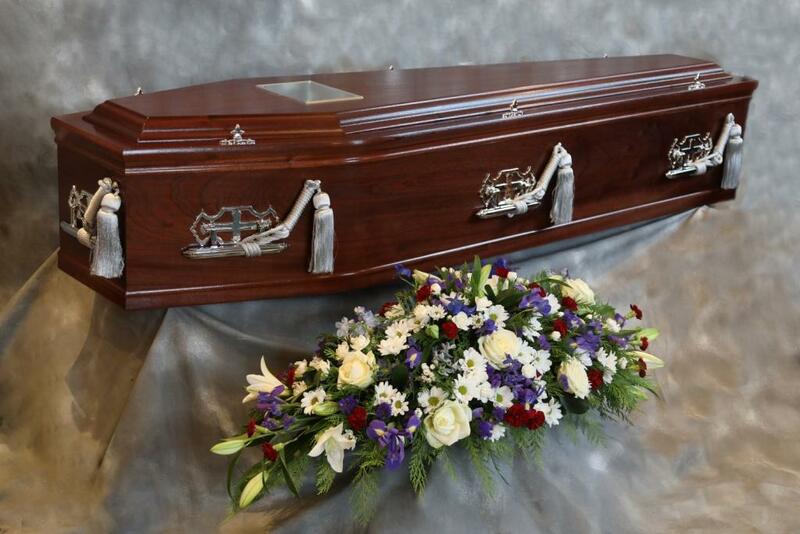 We then furnished the coffin with chrome effect handles, back plate & name plate, with silver lowering cords. The interior is fitted with a luxury silk side sheets, pillows and a 4” frill, we normally use an ivory coloured set but a selection of colours are available. The Pentland is a veneered coffin, with flat sides and lid, finished in satin natural oak. This coffin is furnished with plastic handles & name plate. The interior is then lined with a 9” ruffle frill. 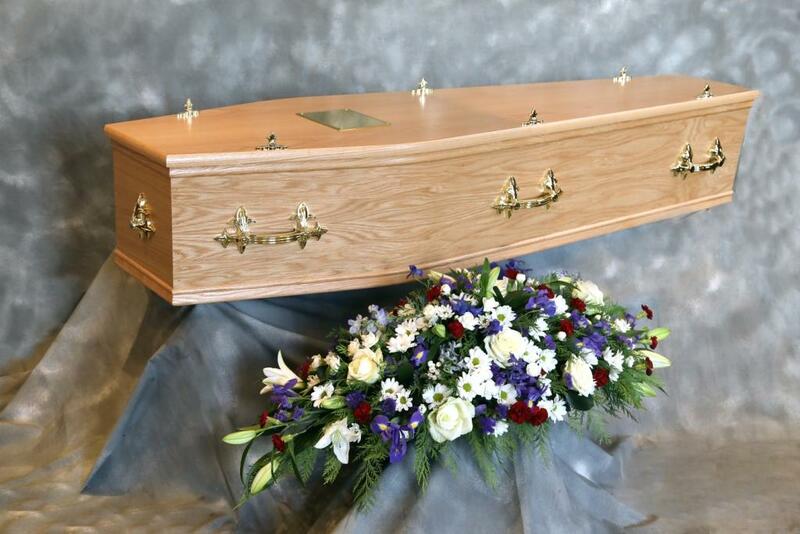 This coffin is furnished to cremation standards but can also be used as an option for a lower cost burial. 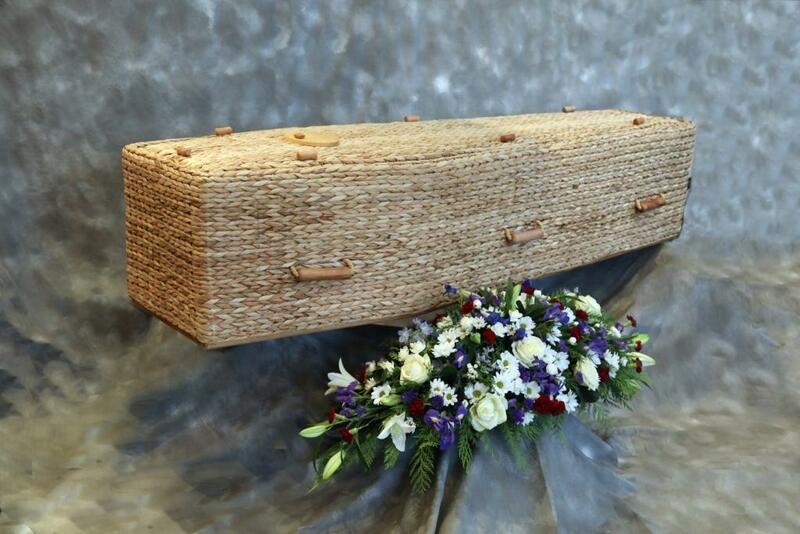 The Water Hyacinth is a woven coffin, made from all natural materials. This coffin has 6 rope handles & a wooden name plate . The interior is lined with a cotton frill.